The United Nations established World Development Information Day—October 24—to draw global attention to development problems and the need to disseminate information which can stimulate cooperation and partnership. As the world attempts to attain the Sustainable Development Goals by 2030, the necessity for accurate information and data becomes even more vital. In the face of insufficient resources and competing priorities, governments require data to make decisions about what challenges, interventions, and programs to invest in. At eHealth Africa, we use the virtuous cycle approach to guide the implementation of all our projects. We believe that collecting, analyzing, and presenting accurate data provides us and our partners with insight to execute our projects. Many of our projects and solutions such as the Geo- Referenced Infrastructure and Demographic Data for Development (GRID3) and LoMIS Suite aim to provide governments and other decision-makers with up-to-date, accurate information that can help them make the best decisions for various populations. We also develop tools and technologies that make the process of data collection and analysis even more efficient. Here are a few examples of how eHA is providing real-time data to aid development through our projects. LoMIS Stock is a component of LoMIS Suite, a solution developed to address vaccine inventory challenges. 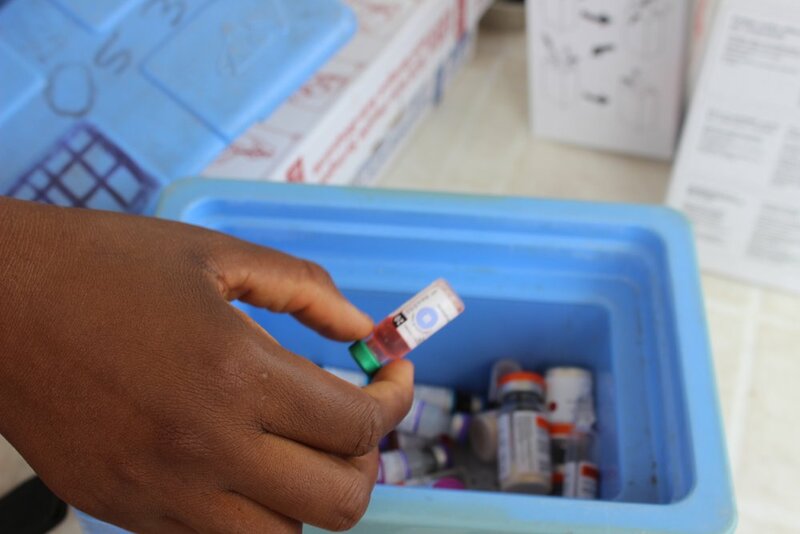 Health workers at the facility level can enter data on a daily basis and submit weekly reports about vaccine stock levels and the status of cold chain equipment through the mobile application. Supervisors can access this data through the LoMIS Stock dashboard and address issues such as low vaccine stock levels and cold chain equipment faults, at the health facility promptly. Thanks to this real-time data, vaccine stock-outs can be prevented. Through the Geo-Referenced Infrastructure and Demographic Data for Development (GRID3), eHealth Africa has collected geospatial data for over 500,000 points of interests including schools, farms, water points, health centers etc. across 25 states and the Federal Capital Territory. Using this data, decision makers in various sectors can plan programs and interventions to effectively address key population groups. Currently, the GRID3 team is conducting a data and technology transfer to the Kaduna State Bureau of Statistics (KDBS) to ensure that the state government and relevant ministries, departments and agencies are able to analyze and utilize this data for development. Earlier this year, eHA launched Aether, a reliable and secure development platform that enables organizations to build solutions that curate and exchange live information. Aether was developed to address the recurring challenges we faced when building tailored solutions for individual projects. There was a clear opportunity to solve these challenges with a unique application that made large-scale data collection and curation easier so that informed decisions could be reached faster. Aether facilitates interoperability and addresses the issue of data security and privacy and is available as open source and is freely available to everyone. At eHealth Africa, we believe in the power of data to transform lives and stimulate development. This World Development Information Day, we are more committed than ever to support our partners and stakeholders by developing tools and technologies that can improve access to accurate data.